For over a century the Digby and Area Board of Trade has served the business interests and aspirations of one of Nova Scotia’s most storied and successful seaports. 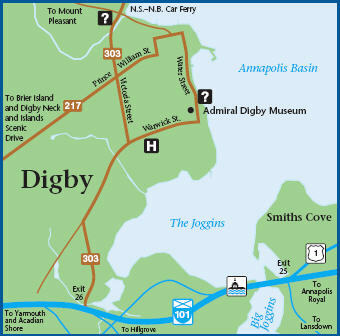 Digby is positioned on the periphery of one of North America’s most sustainable and lucrative fisheries, which is and has been the main industry over the years. Lobster, scallop and groundfish are the foremost species fished at this time. Other important industries in the area include forestry, farming, fur, and tourism. With major multimillion dollar port facility improvements, Digby is building its name as Nova Scotia’s Fundy Port, and the Digby and Area Board of Trade has most recently been at the forefront in support of private businesses, local entrepreneurs and all levels of government in pursuit of development of renewable energy initiatives. This has been especially rewarding as we witness the increased global interest in our area from proponents with renewable tidal energy proposals. With over 60 members the DABT is actively campaigning for new membership recruitment, and the results are already beginning to show with increased attendance at meetings and a business community attitude that reflects a positive “can do” approach to economic development and our commercial future.